The number tower is a fun kid's puzzle that is a great test of maths skills but in a fun way. The puzzle starts with a tower that has some numbers placed and others are empty. The aim of the puzzle is to fill in the missing values and complete the puzzle. 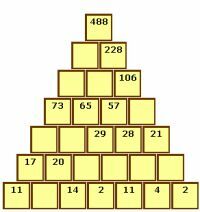 Each number is the sum of the two numbers beneath it in the tower puzzle. Using logic and maths ability, every puzzle can be created without guessing.